The toll for using the Severn Crossing when entering Wales from England will be scrapped by the end of 2018. It will now be free for all road users - motorbikes, cars, vans and HGVs - meaning around 25 million drivers a year travelling on the M4 and M48 will no longer have to pay. The charge currently stands at £6.70 for cars and £20 for HGVs. The removal of the tolls could mean a saving of up to £1400 for regular car users of the two bridges. It will also be a big boost for businesses in Wales which have long been hampered by the fact there's a charge to cross the Severn bridge into Wales. Supermarket giant Tesco has one of its biggest UK distribution centres in Wales, just minutes from bridge. 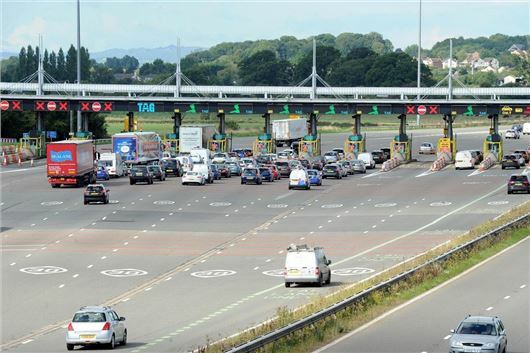 At its peak, it was spending more than £1 million a year on the Severn toll. Indeed the fee is often referred to as the 'tax on Wales'. Originally, tolls were charged in both directions, but this was changed in the 1990s to eliminate traffic backing up onto the bridge. There's been a road link across the River Severn since 1966. However, an increase in traffic and the fact the original bridge had to close in high winds, forcing drivers into a huge detour, meant work began on the second Severn Crossing in 1992. The 'new' bridge opened in 1996 and cost £3.80 for a car at the time. That seems cheap compared to current prices but when the original bridge opened in 1966 it cost two shillings and sixpence - the equivalent of 12.5p today. The news also brings back the debate over charges for the Dartford Crossing. Since opening in 1960, drivers have had to pay in both directions - it currently stands at £2.50. The charges were intended to be removed when the construction work had effectively paid for itself, which would have been in 2003. But the Transport Act in 2000 changed the toll to a charge that could continue to be levied and earns more than £70 million a year. Tolls just add to traffic congestion. on the contrary glidermania, I worry that abolishing the tolls is going to make the route even busier and make housing on the wrong side of the bridge (ie between Newport and Lydney) even more expensive as they become dormitory suburbs of Bristol. At present to avoid congestion on the M4 tolls I take the M48 when the M4 seems busy. As someone who commutes daily from Cardiff to Bristol, I will however appreciate the extra £1200 or so in my pocket each year. So, when will the powers that be honour the previous agreement to scrap the similar toll charges at Dartford. It was always stated that these would stop when the capital costs were recouped but this has not happened. Back in the day (early 1970's) the toll was 12p. Based on that inflation, petrol should now be about 18 quid a gallon, based on the then price of 33p. If they scrap tolls on the Dartford Crossing, I wonder what will happen to balances in DartCharge accounts especially when the minimum you can add to an account is £10.